I had never heard of Lethal League before reading about it in this NeoGAF thread, but apparently the single-projectile fighting game made a splash during the grand finals of Ultimate Fighting Game Tournament 9′s mystery game tournament back in May. Now its developer, Reptile Games, has announced that a standalone version of the Flash game is in development. 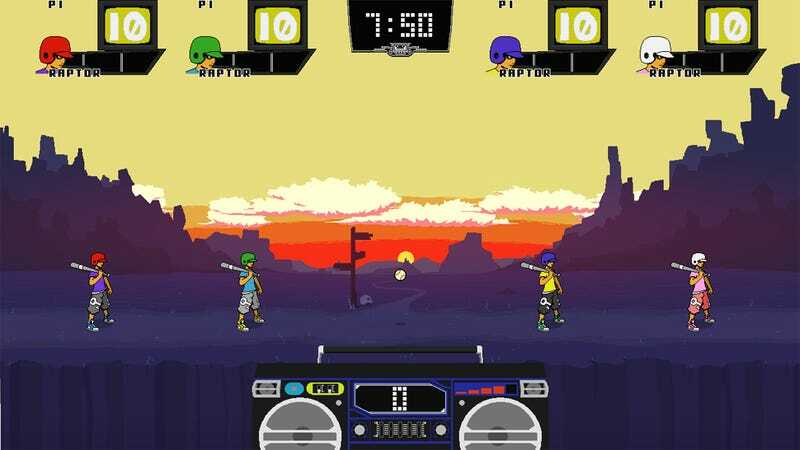 Lethal League features local multiplayer in which two players use baseball bats to smack a ball around and attempt to hit one another. The ball bounces off the walls, and the players often get into back-and-forth volleys like Link and Ganondorf in the second-to-last boss fight of Ocarina of Time. Reptile promises that the new standalone will feature more stages and characters, new special abilities, online multiplayer, gamepad support, and "lots of boomboxes" (whatever they do). It will also feature four-player gameplay, as you can see in the pre-alpha screenshot up top. See the game in action in the video below (skip to about 12 minutes in), play it here, and watch Lethalleague.com for more info. The latest update is a shot of a skateboarding robot named Switch. Radical.